Wave patterned low pile bath rug. Easy clearance for most doors. Pile height 15mm / .60in rug. High quality, dense, very soft medium pile . 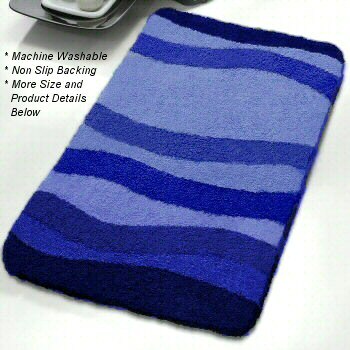 Royal Blue: Affordable low pile bath rug that will bring the ocean into your bathroom. The range of blues include a very dark blue, royal blue, sky blue and medium tone blue. Coordinated Lid Cover: Solid Royal Blue. Ruby Red: True red tones in this rug makes it much easier to coordinate with other red tones in your bathroom. The range of reds include a deep dark red, carnelian red, ruby red, a medium tone red and bright ruby red. Coordinated Lid Cover: Solid Ruby Red. Elongated lid cover for the Miami design is a solid color.